Slip-fit bath spouts contain a slip-fit assembly that is held in place with a setscrew. For threaded installations, the slip-fit assembly is removed by loosening the setscrew so the spout can be threaded onto the pipe. For slip-fit installations, the setscrew should not be loosened because the slip-fit assembly must stay in place. If the slip-fit assembly was mistakenly removed, it can be reinstalled into the spout, but this may be difficult. The recommended procedure for slip-fit reinstallation is shown below. 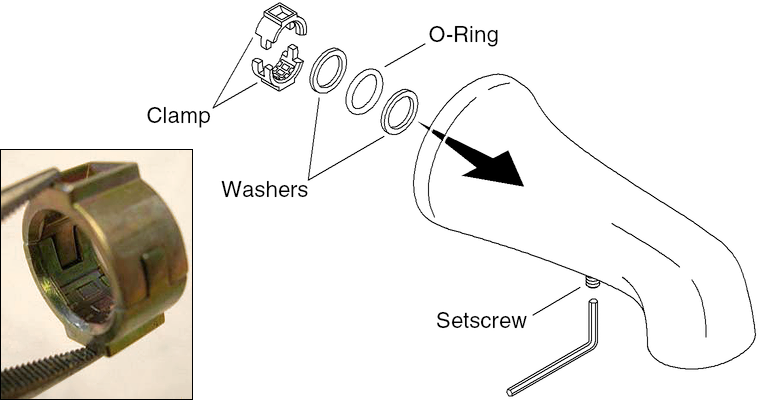 The slip-fit assembly consists of a two-piece clamp, two washers, and an O-ring. The clamp pieces fit together, but are not fastened to each other. The challenge is holding the two pieces together while inserting them into the bath spout. To hold the clamp pieces, firmly grip the two halves together with a needle nose pliers. Slip the assembly back into the grooves inside the spout. Secure the assembly in place by tightening the setscrew.